In game advertising, the idea of putting dynamic, changeable ads in the background graphics of video game is still an infant industry but it’s one endowed with high hopes (even as some fans cringe at the thought of ads taking over their play space). According to a recent eMarketer forecast, spending in the sector is poised to increase 133% over the next 5 years (through 2012). Yankee Group has predicted even more substantial growth calling for a market size of $971m by 2012. Across the gaming industry, all the big players from Activision to Electronic Arts to NBC Universal are taking steps to participate. Tuesday, EA made a deeper commitment and extended an agreement made in July with Microsoft subsidiary Massive for two more years. The new deal will extend the two companies previous partnership through 2010. Under the agreement, Massive will provide ads for a host of EA sports titles including the next two installments of Madden NFL, along with EA’s NASCAR racing title, NBA Live, NHL hockey and Need For Speed racing franchise. The ads will be served to Xbox 360, and some PC versions of the games. They will not stream to PS3 or Wii titles at this time. The ads served through Massive’s network will be contextual to the settings in the game’s storyline. That means, if a player is at an arena; ads will likely replicate the billboards or be placed on the scoreboard. The arrangement will probably include a mix of static two dimensional ads, video/sound combination units (like the billboards) and 3D objects (like soda cans that can change brand emblems from one day to the next). As was the case in July when the original deal was struck, the story here is not so much that EA chose to work with Massive over rivals but that EA chose to work with anyone at this time. The in-game ad market is still very much in early stages of development. Picking an ad network as a partner so early remains a strong endorsement for the potential game developers see in the sector. (Massive has also struck a deal to work with Activision). 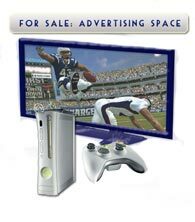 For those looking for more detail on the industry, previous articles on the in-game advertising industry, and also on how similar dynamically updated game play may eventually change how games are sold and marketed, add some color. Additional context can also be found in the related articles listed below.